Back in May I wrote a post titled My Summer 2008 "See How Paperless I Can Become" Project. The Amazon Kindle was the device that I felt had the most potential in reducing my "paper addiction". I saved a lot of gas and donut money subscribing to the electronic version of the Boston Globe when I was out on Cape Cod. Over the summer I wrote more posts about my experiences with the Kindle - I've got all of those posts linked here. So.... how did I do? A picture probably explains it best - here's a shot of the paper currently in my bag along with my Kindle that has replaced most of the paper. 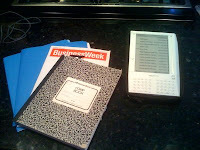 Two file folders, a copy of Business Week, a composition book I use to write notes and my Kindle - that's it...... less than a pound of paper. Shifting gears from paper to the Kindle took some getting used to and the conversions are not perfect. The Kindle uses locations instead of page numbers which can be confusing. Here's an example, In May I attended an OP-TEC NSF National Visiting Committee meeting at Indian River State College in Florida. Prior to the meeting a 200 plus page Word document had been distributed to attendees. Instead of printing out the 200 pages I converted the word document to a Kindle friendly azw file and loaded the document on the Kindle. Now - the Kindle screen is not an 8.5 x 11 inch screen so it does not display a full Word document page at a time. What is displayed is smaller than a page. The amount of text displayed also varies based on the font size the Kindle is set to. So..... page numbers don't make much sense to the Kindle - for this reason the Kindle uses location numbers that do not map to page numbers. Back to the meeting in Florida - everyone else had hard copy and I had electronic copy - as we were flipping through pages I found it difficult to keep track of page numbers others were referring to. In the end I cheated and started using a hard copy I had been given when I got to the meeting. I've also had rare problems with PDF file conversions - I heard Jeff Bezos say once somewhere (I cannot remember where) that PDF conversions work perfectly around 80% of the time. Bezos calls the conversion "re-flowing". I would put it at 95+% based on my experience. I find myself pdf'ing anything that can't be directly converted to an azw file. That includes PowerPoint presentations, flight itineraries, web pages, google maps, etc. I write the PDF in my desktop application to disk and then send the PDF document to Amazon for azw conversion. It works great! The Kindle is great for reading finished documents but not very functional when tracking changes in draft documents being passed back and forth. In these cases I find myself converting the Word document to azw format and placing it on my Kindle. I then read the document on the Kindle and use my notebook computer to make the edits. I can't organize a folder structure on my Kindle. All documents I convert to azw display on the main screen and sometimes I have to scroll through lots of documents to find the one I want. I can organize the files in folders on the SD card in the Kindle - I just can't bundle them together in one folder on the main screen. With regards to textbooks - it is getting close. Things like charts, graphs and color pictures are tricky - the Kindle only has 4 shades of gray. I believe textbook support would be much better if all figures, tables, graphs and pictures were designed to work with the Kindle. I'm confident Amazon and publishers are working on these issues and we will see Kindle ready classroom versions soon. In summary - am I paperless? I would say pretty darn close. You shed of lot of weight there Gordon! At the office we were curious how you were doing and the transformation was a "wow" moment. Maybe in the future you will be able to loose the notebook because you will have a Kindle that you can take notes on. Thanks for sharing this. "...I find myself converting the Word document to azw format and placing it on my Kindle. I then read the document on the Kindle and use my notebook computer to make the edits." I started doing just that with my translation work once I got my Kindle. Reading on the Kindle is much less tiring for me than reading on the computer screen. Great blog, Gordon! Gordon, How do you convert to an .azw file? I thought that was proprietary to amazon.com. If you are using Mobipocket creator, that is a .prc file. Do you have something else? Some Good Broadband News for the U.S.